Learn about our Debt Consolidation and Debt Settlement services and avoid bankruptcy, clear your loans and fix your bad credit today. We provide our services for those in New London County, Norwich, Waterford and the rest of the surrounding counties and towns in Connecticut. At CT Debt Consolidation, we have one of the very few professional approaches to helping your decide on what is the best option for yourself. First, we explore in depth all five options consumers use to deal with debt. You pretend that the problem doesn't exist or that it will just go away. You pretend that the lawsuits against you are meaningless and nothing can happen to you. You don't open your bills and you ignore the problem. THIS OPTION DOESN'T WORK. OPTION #2: "Rob Peter to Pay Paul"
This is by far the most popular approach. When you try to have balance transfers, or paying one credit card with another credit card, or obtaining second mortgages on your home, or obtaining a 401K Loan to pay-off credit card debt, these are all examples of 'robbing Peter to pay Paul'. And, indeed, this approach appears to work for a while. But since you can't borrow money indefinitely, eventually the balloon expands so far and that it bursts. I tell clients that Fortune 500 Companies can't "borrow their way out of debt" and the greatest country in the world, the USA, can't make this approach work. What's amazing to me is that people know that this approach can't work, but they use it all the time. It's also part of Option #1. THIS OPTION DOESN'T WORK. This is where you work all the overtime you can obtain and/or you get a second job. You are working at least 12-18 hours per day, 7 days per week and your debt load is still increasing. As Will Rogers said, "Once you realize that you are in a hole, you should stop digging". THIS OPTION DOESN'T WORK. Any OPTION which does not involve the Court is an "informal strategy" or an "informal workout." #1: Debt Management a.k.a Credit Counseling. Credit Counseling is actually a misnomer because there really isn't any counseling regarding your credit or your credit score. Debt Management is a 100% repayment on your credit card debt. This strategy compares to a Chapter 13 Bankruptcy, where you pay a 100% dividend to unsecured creditors. There are great similarities between Debt Management a.k.a Credit Counseling and a Chapter 13 Bankruptcy Plan. However, the Debt Management/Credit Counseling Companies were created by the credit card industry and there has always been the suspicion about them that they are really "soft collection" agencies. The largest Debt Management Company / Credit Counseling Company is Consumer Credit Counseling which has been purchased by Money Management International. They have been accused of not offering independent and objective counseling regarding your options in handling your debts. However, even though I have found at times that some of the accusations are well founded, but at other times the criticism is not well-founded. I have found that Debt Management Companies have accused bankruptcy attorneys of just "throwing people" into bankruptcy and not urging them to take responsibility for their actions. I have found that bankruptcy attorneys, because of their training are actually biased against Debt Management companies; and I have found that Debt Management companies because of their orientation and culture are biased against bankruptcy attorneys. I have also found no one that helps the consumer objectively weighs the pro's and con's of Debt Management, Debt Consolidation, Chapter 7 Bankruptcy and Chapter 13 Bankruptcy. I have developed a unique chart, which gives the pluses and minuses of each approach. Also, I have developed a unique analysis, which allows you to compare all of the options. And I realize that when making a decision or selecting an option, you need the experience and guidance of an attorney who has actually participated in all of the options. On this website you'll find an incredible calculator for analyzing all options for unsecured debt which would be credit card debt, personal loans, and medical bills. There are two major trade groups for Debt Management and you can find them at www.FCAA.org (Financial Counseling Association of America) and www.NFCC.org. (National Foundation for Credit Counseling). We have had clients use a Debt Management Plan wherein we repaid the credit cards 100% and we are doing Debt Consolidation Plans where you pay a portion of the total debt and negotiate with creditors for Consolidations. And obviously, I have for over 32 years guided clients in using Chapter 7 and Chapter 13. THESE OPTIONS CAN WORK BUT YOU NEED AN ATTORNEY WHO HAS ACTIVELY PARTICIPATED IN THESE OPTIONS TO GUIDE YOU. An attorney's allegiance is first to his/her client's best interest according to our ethics. Therefore, your best analysis and guidance will come from an attorney who has actively used all the options with his clients. Unfortunately, there are very few, if any, attorneys who can tell you that they have done debt management, debt Consolidation, Chapter 7 and Chapter 13 with any amount of significance. Debt Management Companies were first created by the Credit Card Industry, and their income is highly regulated by the Credit Card Industry. This makes these companies subject to the criticism that they are not independent of the Credit Card Industry when giving you advice. Why use Debt Management or Debt Consolidation? But let's say that you qualify for filing a bankruptcy petition, but you elect not to file. After you have been informed of all the pluses and minuses of filing bankruptcy or using debt management or Debt Consolidation, you have to make the final choice. If you elect a non-bankruptcy option, then you should be assisted in a non-bankruptcy option, which is actually more involved than the filing of what is called a 'Straight Chapter 7 Bankruptcy Petition'. Why is it more evolved? The reason is that you don't have the protection of the Automatic Stay of the Bankruptcy Court when dealing with creditors and your financial affairs will take considerably longer than 90 days to settle. If you have a ton of credit card debt, Chapter 7 is usually the best option of all the options for dealing with debt. A Voluntary Chapter 7 is one which you voluntarily petition the court for relief from all of your debts. It's called a 'Liquidation' because all your debts are 'liquidated' within 90 days and all your assets are 'liquidated'. However - and this is very important - since the purpose of a Chapter 7 is to give you a 'fresh start', it makes no sense to take away all of your possessions and sell them for the benefit of creditors. Therefore, you have exemptions for your assets. You can exempt out your assets from the liquidation process. And this is very important. Many people think when they come to my office that in a Chapter 7 that they are going to lose their home, car, pensions, furniture and cash. I have explained to clients that they could picture the Chapter 7 as a conveyor belt that is carrying items into a furnace to be 'liquidated'; that they load their debts onto the conveyor belt. They also have to load their assets onto the conveyor belt but they have exemptions and those exemptions allow us to take their assets off of the conveyor belt. Therefore, I ask them to picture just their debts being liquidated or canceled (discharged) and they keep their assets. However, having said the above, you have to confer with an attorney in order to make certain that your assets are exempt. There are times when assets are not exempt. Only an attorney experienced in this area should help you. The famous last words I hear from a client are: "I have a simple case” and therefore, how much are you going to charge me? I have found that in cases which one would think that they are 'simple', are lurking the most complex issues imaginable in Bankruptcy. I tell clients that it only takes 'one nuclear bomb to ruin your day' and lurking within the Bankruptcy Code is vast amount of landmines just waiting for you. I blame this on the banking and credit card lobby, which is constantly changing the Bankruptcy Code in order to 'screw you', the consumer. I'm not supposed to talk this way, namely, in such a blatant disregard for euphemisms. I have told clients that there are two classes of people in our society: the screwer and the screwed. And we're the screwed. We have to be very, very vigilant and ready to take flight in a fraction of a second; otherwise, the hyena credit card companies will devour us. If you use a Chapter 7 option, you should be informed on how to restore your credit score within 12-24 months post-bankruptcy, and I have an E-Learning website for this purpose called, www.PennyWatchers.org. My clients can use this website and there's no charge for using it. A Chapter 13 is a re-organization of all your debts. It takes 3 to 5 years and you don't get a discharge until the end when you have completed your Chapter 13 Plan. It's more expensive than Chapter 7 because it takes far more work, time and effort than a Chapter 7. A Chapter 13 is used primarily to save a home from foreclosure. It can be used to pay-off credit cards and re-pay non-dischargeable taxes. It's especially helpful if there's no interest running on the tax debt but this is not always the case. Theoretically, you could use a Chapter 13 to repay 1% of your credit card debt and be out of debt. However, I have never seen this happen. Usually, a person is paying at least 10% of their total credit card debt. But again, this depends on your income and assets. Most of the time the Chapter 13 Trustee's Office is scrutinizing your budget and assets to see if you can re-pay 100% on your credit card debt. And an experienced Bankruptcy Attorney can advise you of the odds of you paying 100% on your credit card debt in a Chapter 13. If you have to re-pay 100% of your credit card debt in a Chapter 13, then there might not be a real advantage in using a Chapter 13. You'd be better off using Debt Consolidation where you re-pay 50% on your debt. However, there are many contingencies that have to be weighed besides the pluses and minuses chart which I have posted on this website. And if you elect to use Debt Consolidation, you need the guidance of an attorney who is very familiar with collection law in order to protect your assets and wages from the creditors. When you are doing a Debt Consolidation, this doesn't prevent the creditors from suing you in court. We represent you in any lawsuit and there are no additional legal fees because our monthly retainer fee which is built into your total monthly payment covers this possibility. Chapter 13 is more powerful than a Chapter 7 because in Chapter 13 it's possible to void second mortgages on your home if there's insufficient equity for the second mortgage and it some cases, you can reduce car payments. You can't do this in Chapter 7. If you are behind on your mortgage, Chapter 13 allows you to take the arrearage and spread it out over a 5-year period but you have to also continue to pay on your mortgage. If you owed $10,000 in arrearage on your mortgage and your mortgage payment was $800 per month, in Chapter 13, you'd continue to pay on the mortgage of $800 per month and on the arrearage you'd pay approximately $166.00 per month for 5 years. (This is a very over-simplified statement because I haven't factored in Trustee fees and attorney's fees.) Therefore, your total mortgage payment would be $966.00 per month. If you could pay this amount, you would be able to successfully stop any foreclosure and the Court would order that you be allowed to repay on your mortgage arrearage. Thus, you'd save your home from foreclosure. What Should You Do If You Are Sued While You Are Making Your Payments In A Debt Consolidation Plan? First, don't panic or hyperventilate. It won't help and it's unnecessary. Stay calm and keep it 'cool'. I'll review with you strategies on protecting your checking accounts, savings accounts and wages. Also, I'll review with you strategies on protecting all your assets. Your assets can be substantially protected from lawsuits by following my strategies. However, if you aren't extremely careful, your assets will definitely be exposed to the judgment creditor. It's imperative that you make an appointment with my office. Since you are a client, this will be a FREE CONSULTATION so you don't have to worry about incurring costs for a consultation, which ranges from $150–$300. Again I repeat, this will be a FREE CONSULTATION since you are a client. WARNING!! Do not tell the creditor that you are going to 'see your lawyer'. Neither the creditor nor the creditor's attorney will care or be impressed. Every day of the week, they are being told that someone is going to 'see their lawyer'. And SECONDLY, when you tell them that you are going to see an attorney, it only tips them off that they should act faster against You! Simply make an appointment with my office. 1. Do they have an attorney who helps analyze all of your options? Many times Debt Negotiators will tout that they have 'Certified Debt Negotiators' and 'Certified Debt Consultants'. If they have Certified Debt Negotiators', they obtained this designation by taking a simple one-hour quiz, which no one can possibly fail. The quiz is administered by an organization that you have never heard about and exists solely for the purpose of pinning 'merit badges' on anyone who applies. They have no professionals actively supervising a Debt Consolidation program. Some times there's a law firm that offers Debt Consolidation but they are usually out-of-state and to really have a law firm, which is accountable to you, they MUST have a physical office in your state. 2. Do they analyze clearly and simply all of your options and fully disclose all the negatives and positives of any option? One of the reasons that they don't present all 4 MAJOR OPTIONS is because they simply DO NOT UNDERSTAND THE DETAILED WORKINGS OF THE 4 MAJOR OPTIONS. They haven't even been involved in the 4 Major Options, yet they are pontificating based on false information (some would say deliberate lies) and no experience. And the Debt Management and Debt Consolidation companies do have an attorney to advise you about Chapter 7 and 13. Another point that should be made is that when they attempt to do any type of financial analysis and present it to you in the form of a chart, their analysis is usually flagrantly defective because again, they really don't know what they are doing. They guess at the analysis and skewered it in their favor. If they are supposed to be 'certified debt counselors', shouldn't they be able to substantially and accurately tell you what any option will cost? They can't and this goes to the heart of the matter. 3. Are they BSI Accredited? There are various companies who for a fee will go to an office and audit the business and determine whether or not that business has certain forms and procedures in place. These certifying companies such as www.iso.org and British Standards International (BSI), cannot pass judgment on the accuracy of the counseling. They only pass judgment on having in-place business procedures to process business. If these certifying agencies had real teeth, they could and would suspend a company's license to practice their trade or profession. They have no such power to revoke or suspend a license. However, a Debt Consolidation Company will tout their certification as if they have been anointed into sainthood. Nothing could be further from the truth. 4. Does the Judicial Statewide Grievance Committee regulate them? Doctors are licensed by the Department of Health; CPA's are licensed by the Department of Consumer Protection; Attorneys are licensed by the Judicial Department and the attorneys are subject to random audits and the Bar Grievance Committee. You can lose your license to practice law when you violate the ethical obligations of the legal profession. Any Debt Consolidation Company has to be licensed by the Connecticut Banking Department. See, www.ct.gov.dob.gov and you can Verify a License on this website. You have to look under Debt Negotiators and you'll see that there aren't many that have a license and the ones who have a license are predominately mortgage companies because they want you to take a mortgage on your house to pay your credit card debt. And it's never a good idea to take another mortgage on your home. Banks try to sell you the idea that you should 'put the equity in your home to work' but they are really urging you to use your home as an ATM. It's never a good idea to convert your unsecured debt into a secured debt. You have to separate the advice from the sale. The attorney can only advise and can't sell you anything. Therefore, there's no conflict of interest between his/her advice and purchasing anything. 5. Is the Debt Consolidation Company regulated the State Banking Department? Due to the tremendous amount of fraud perpetrated by Debt Consolidation Companies, the Attorney Generals in every state organized an effort to stop the fraud by requiring that a Debt Consolidation Company has to be bonded and licensed by the Banking Department. In Connecticut, you can go to the website, www.ct.gov/dob and click on 'Verify a License', and you can check any company that has a valid license. You'll find 'Debt Adjusters' and those companies are highly regulated by the credit card industry because they were originally founded by the credit card companies and they only offer the repayment of all credit card debt. You should check if the company you want to handle your debt management plan is licensed and bonded, and you can click on a button and find any 'Debt Adjuster' which is licensed with the Connecticut Banking Department. Also you can call their toll free number: 1-800-831-7225 and ask for the 'Consumer Credit Division'. I have found them to be most helpful. You can ask if their license is current, have they posted their bond and have there been any complaints or sanctions entered against them. These companies follow the credit companies' policies and rules, and they can obtain a repayment plan based on an interest rate of approximately 6% - 7% versus what you are required to pay, namely, 18% to 35%. For some people, this can be a good option. In Connecticut, you'll find a few Debt Consolidation Companies which are called, 'Debt Negotiators' with a license to negotiate debt but for the most part these companies are mortgage lenders. They would have you exchange your unsecured debt for secured debt. This is 'robbing Peter to pay Paul' and causes you to use your home as an ATM which is never a good financial strategy. 6. Does the Debt Consolidation Company make proper disclosures? And what are those disclosures? b. Do they fully disclose that your credit score will be terrible during the entire time you are trying to do debt Consolidation? Or do they couch it in terms that it will 'adversely affect your credit'. The ones which try to have some semblance of honesty will tell you that debt Consolidation will 'adversely affect' your credit score. They don't say that your credit score will be poor. c. Some debt Consolidation companies will tell you that while you are enrolled in Debt Consolidation, interest will continue to accumulate on your debt but many don't tell you this. d. Some debt Consolidation companies will tell you that the cancellation of debt can be considered income to you but I haven't seen on any debt Consolidation company's website IRS Publication 908 which explains in detail about this issue. If the Debt Consolidation Company doesn't have a CPA on staff - I don't know of any that do - they should advise you to consult with a CPA before starting a Debt Consolidation plan. e. Does the Debt Consolidation Company advise you as to their 'Completion Rate'? Out of 100 clients, how many of them actually complete their debt Consolidation plan? Do they discuss this issue with you? If they do honestly tell you their completion rate (which they should advise you of since they are certified under BSI or ISO) and it's low or they won't disclose this information, or in the alternative they'll lie about it. And why is the rate so low? They aren't properly screening and qualifying their clients and they don't clearly explain all of their debt options. 7. Does the Debt Consolidation Company have a physical office, which you can visit for a consultation? In Connecticut, at this time there are no in-state licensed Debt Consolidation Companies who have a physical office in Connecticut (except mortgage companies); they are all on the Internet or the telephone. And they are located predominately in California, Texas and Florida. Why don't they have a physical office where you can have a private and confidential consultation? The reason being is that 'debt Consolidation companies' are the latest 'get rich quick scam' in the United States. They are 'fly by night' companies because they are 'here today and gone tomorrow'. If they do business either on the Internet or the phone and are located out-of-state, they must have a license to operate in Connecticut. Why don't they simply obtain a license? Answer: In order to obtain a license, they have to post a bond and if they commit fraud, you can sue them and the bond company which I call the 'cash register'. It's very difficult to sue a company in California but when they have posted a bond, you can sue both the company in California and the bonding company over which Connecticut has jurisdiction. That's why they don't want to be license. Further, they would have to comply with the law. The law requires a set amount that can be charged and only after the work is completed. But the Debt Consolidation Company a/k/a Debt Settlement Company wants to charge all its fees upfront before they deal with any creditor. They collect millions of dollars in fees and then simply 'skip the country' and the consumer is left 'holding the bag' with no legal recourse unless a bond had been posted. This might sound outlandish and ridiculous but I assure you that unfortunately it isn't ridiculous. Simply do research on the Internet. 8. Do they fully disclose who they are on their Web Site? When you go to any particular "debt consolidation website" and click the pull-down menu for 'Who we are?' does it fully identify who the person in charge of the Debt Consolidation Service is? Are the actual people who offer you a debt Consolidation service listed and shown on the website? Do they have an actual address or just a Post Office Box? Why can't you determine who is in charge of the offering the service? When you check on www.whois.com to determine the owner of the website, do you get an out-of-state company which has no meaning to you? Why are they hiding? Who is the company president or the owner? What are their professional credentials? And if they are an attorney but this isn't disclosed. Why? Why are they not disclosing that they are attorneys who are operating the debt Consolidation company? There are some Debt Consolidation Companies which are operated by attorneys for example Morgan and Drexen in California and they have been disbarred. Regarding my statement about Morgan and Drexen, you can go to www.consumerfinance.gov and find this information or you can click onto this link. And you search for them on Youtube and see some of their ads! The 'Debt Consolidation Business' is the latest and hottest 'get rich scheme in America'. Many people would rather try anything than file bankruptcy. Embarrassment! People can feel embarrassed when they file for bankruptcy and this embarrassment prevents them from exploring it as an option. The ads read, 'Avoid Bankruptcy' because it is portrayed as walking the gangplank. Everyone will sniker at you. Laugh at you. You'll be publicly humiliated. This is really not the case but people's perceptions are very important and this perception is there. They believe in their subconscious that if they file for bankruptcy, they will be confronted by a masked and cloaked man who will approach them while they are on the witness stand and fling his cape over his shoulder, and point directly into their face, and scream, 'You didn't pay your bills! You filed for bankruptcy and you are bankrupt!'. And you will want to crawl under a rug. Nothing could be further from reality but people have visions or nightmares of the above and this makes them want to avoid bankruptcy and avoid even the discussion and comparison of it to other options. Also consequently, they see an ad on television and dial the toll-free number and they are on their way to conning themselves. The slick telemarketer has his/her script and follows through in the days after you have contacted them, and there's a good chance that you will go with them. It's a numbers game. They know that out of 20 calls, they'll land at least 5 fish. Embarrassment is really the first reaction to financial problems and this embarrassment results in ignoring the problem, putting your head in the sand and then going to the Internet which is the 'Wild West of Fraud', unfortunately. And people know what they are being told is too good to be true but they want to believe it and they let themselves be conned. Always remember this simple rule of thumb, Does the Debt Consolidation Company have a physical office where you can go and have a consultation?. If the answer is 'no', be warned! Also, people fear bankruptcy. They think that they are going to lose their home. They think that they will never be able to buy a home if they file for bankruptcy. They are in denial and they just can't believe any professional who tells them that most of time by filing bankruptcy, it will speed up their opportunities to buying a home and/or restoring their credit score. And I'm always amazed at the number of people who are afraid that if they don't pay their debts that they will go to jail. Nothing could be further from the truth. Debtors' Prison was abolished approximately 200 years ago. Further, if people went to jail for not paying their debts in the United States, more people would be in prison than would be outside of prison. I had one young lady contact me via email that asked me questions about her options. After several emails, she wrote, 'Ok, I'm ready to accept the fact that I'm a failure. I'll make an appointment'. I immediately wrote back to her and said, 'Yes, you are having financial problems. But the fact that you are having financial problems doesn't make you a failure.' I referred to the biographical sketches on Walt Disney who filed bankruptcy, Henry Ford whose company Ford Motors filed twice and Milton Hershey, who filed 3 times. And many other famous Americans that filed bankruptcy. At one time, no one mentioned the fact that someone died from cancer. It was a mark of shame on the family. We still have to make progress in their area of personal finances because filing for bankruptcy is equated with being 'marked' or 'branded' as a failure. Yes, your finances can be out of control and yes, you could have been careless in handling your finances, or you just had a run of bad fortune like Job did in the Old Testament, but that doesn't mean you are a failure. But the scammers and con artist prey on the psychological weaknesses of people and the harsh judgments they rendered against themselves. I have had people come to my office and tell me that the filing of bankruptcy is against God's word. It's sinful. I have referred these people to Deuteronomy 15:1-2. "At the end of every seven years thou shalt make a release. And this is the manner of the release: Every creditor that lendeth ought unto his neighbour shall release it; he shall not exact it of his neighbour, or of his brother; because it is called the LORD's release. Deut. 15:1,2." In the book of Leviticus Moses announces God's decree that special years be set aside for the forgiveness of debt, freeing of slaves, and other measures re-balancing the social order. It was never God's intention to create a society where debt was a crime. We see a society where loans were kept to a minimum by law, and gratuity and charity, were kept to a maximum by law. To accomplish this end, God did not outlaw borrowing and lending, but instead He provided that loans would eventually become gifts, and thereby limited loans only to those in need. He permitted the loan to take place, and the obligation to repay to occur, but He limited the legal obligation to repay to a maximum of only seven years. Every seventh year all lenders were to release their debtors from all of their debts. Every seventh year, the debtors were discharged from all their loans and were no longer legally obligated to repay them. The debtor was free of all loans by force of law. One version of the Lord's pray says, "And forgive us our debts as we forgive our debtors' versus ,'forgive us our trespasses as we forgive those who have trespassed against us'. And remember, the basis of all slavery is 'debt'. Paying your debts is a matter of honor and respect for oneself. I have seen people struggling and fighting to pay their debts and actually many times they can be knocked-out and not know it. Their mind is unconscious. Their body wants to keep on fighting and never stop fighting. Fighting for self-respect, dignity and honor. But it takes an independent and professional referee to declare the fight should be over. How Does The Debt Consolidation Business Work As A Scam? Now here's how they make their money. They take their fee of $2,250.00 from all the initial payments you make of $270.83 per month. Therefore, for the first 8 months, all the payments of $270.83 goes to the debt Consolidation company as their non-refundable negotiation fees. Your first 8 months of payments all go to the company itself and nothing is paid to creditors or used to settle your debts. Who are the debt Consolidation companies? They are all out-of-state. There's not one that has a local office in Connecticut except Mortgage Companies. They are located primarily in California, Texas and Florida. You can only reach them by phone or the Internet. How Do You Guard Against Debt Consolidation Scams? Do you (the Debt Consolidation Company) have a physical office I can go to and talk to a real person and/or the person responsible for the Debt Consolidation program? Fly-by-night companies do not have a local and permanent office in the state. You should know that Attorneys are licensed to practice law by the Judicial Department for the State of Connecticut. Attorneys are not licensed and bonded by the Department of Banking but rather come under the jurisdiction of the Connecticut Judicial Department. Attorneys can represent clients in Debt Management or Debt Consolidation. Again, call the Connecticut Banking Department at (800) 831-7225 or (860) 240-8299 in order to verify this information. How The Better Business Bureau Can Actually Help Scam Artists! I have found that once someone gets a bad report from the Better Business Bureau, the slick scam artists have a foolproof way around a bad reputation. They simply open another business under new business name, and viola, they have a clean slate. And as soon as the complaints come in against the new business, they simply repeat the cycle and open another new company. They only have Post Office Box addresses and you only reach them by telephone. Many times when you trace where they really exist, you find that they have a Post Office Box in one state, and the answering machine in that state which forwards calls to another state. This is a real sign that you are dealing with a scam artist. Also, they have several companies with names which are very similar. One company will be the servicing company and another company will be the marketing company, and so on. They create shell business to make it extremely confusing to find them and to know with whom you are really dealing. REMEMBER TO ASK YOURSELF: Do they have a physical office I can visit? Where exactly is it? AND FINALLY, if you are going to have a 3-5 year relationship with a business, you owe it to yourself to visit that office. Call our office at 860-449-1308 immediately for a Free and Confidential consultation where all the options for handling debt will be explained in detail and then make a decision. Our office is located at 1 Crouch St., Groton, CT 06340. Q1. Will all of my creditors accept a Debt Consolidation Plan? The vast majority of creditors are willing to accept a Debt Consolidation. However, we can't guarantee that ever creditor will accept a debt Consolidation proposal. So far, we have never failed to have a creditor accept a debt Consolidation proposal but there are some creditors who take an extra-amount of time to be convince to accept a debt Consolidation proposal. And, of course, a creditor who has previously accepted a debt Consolidation proposal could change their policy and take the position that no debt Consolidation proposals will be accepted. Then you probably would only have a bankruptcy option to consider. Recently, 40 banks are considering offering 'debt forgiveness' on credit cards. They are experimenting with a pilot program of 'debt forgiveness', which is a type of Chapter 7 Bankruptcy. Chapter 7 Bankruptcy has been called debt cancellation which is what some banks are voluntarily considering! But in the bank's case, it's a partial forgiveness of approximately 40% of the outstanding debt. Therefore, you would make payments on the remaining 60% of the debt. This would be called in Chapter 13 'a 60% dividend to unsecured creditors' plan. The average settlement on unsecured debt is 50% of the balance. However, there are many exceptions. Some creditors will only settle at 70% of the outstanding debt and others will accept less than 50% of the outstanding debt. But the overall average is approximately 50%. Q2. What is the cost of a Debt Consolidation Plan? Our fee can vary depending on the nature and complexity of your debts. However, for most credit card cases you should first total all your credit card debt and general unsecured debt. You have the option of including some of your debt or all of your debt. Then at our website, go to Debt Options Analyzer. In the upper left hand corner, you'll find a box labeled: 'Unsecured Debt'. Put your cursor over the box and type in the dollar amount of your unsecured debt. Press enter on your key board. Instantly, all your 'Options' will be analyzed in terms of a monthly payment or costs. Our amazing calculator will give you a good projection as to costs and expenses. Our negotiation fee is clearly labeled. For example, you could have lawsuits pending against you before you come to our office and your wages are attached and there are judgment liens against your home. In our propriety software, when we analyze your options, we calculate what our fee would be in conjunction with a total plan to resolve your financial issues. Give us a call at (860) 405-1000 and we'll gladly estimate all fees and costs and present them to you in writing. Also, you can print-out our Debt Options Analysis and our fees are plainly indicated. However, one price doesn't fit all. Depending on your case, our fees could be increased or decreased. But at least our calculator can give you a 'feel' for what we charge. Q3. Is my information confidential with CT Debt Consolidation? Your information with us is totally and completely confidential because it is guarded and protected by the attorney-client privilege. We contact all of your creditors and explain that you are not to be called and/or visited by the credit counseling agencies. We do not sell, transfer or convey any of your personal information because we are bound under the attorney-client privilege to safeguard all of your confidences. Q4. What happens to my credit during a Debt Consolidation Plan? I tell my clients that while you are doing consolidating your debts, your FICO credit score will be poor. YOU WILL NOT HAVE A GOOD CREDIT RATING OR SCORE. Many times people will have an artificially good FICO score when they come to see us because they are current on all their bills but they are borrowing on their credit cards to pay all their bills! Further, many clients are borrowing on one credit card to pay on the other credit card and they have a FICO score of over 700. I call these credit scores 'false scores' because they are really artificially maintained by borrowing. Or we have clients who are paying on all their credit cards and they are simply struggling. With these clients, it's just a matter of time before they become financially exhausted. When a debt is settled, your credit report will often reflect 'settled for less than full amount' , 'paid not as agreed', etc. These reports will not help your credit score but will reduce it. However, we will review your credit reports to determine if the Fair Credit Reporting ACT (FCRA) is being violated or the Fair and Accurate Credit Transactions Act (FACTA) is being violated. There is no additional fees charged for this service. If we find a violation of the law, we will consider bringing a law suit on your behalf. And we bring such an action on a contingency fee basis which means that if we don't recover any financial settlement for you, there would be no charge for legal fees. If you were not generally retained by yourself, we wouldn't be offering to bring such case on a contingency fee basis. After your Debt Consolidation Plan is completed, we will give you our 2 hour seminar on credit score improvement along with our materials to improve your credit score, and we will advise you that it will take 1 – 2 years to obtain a FICO score of 625 which is considered a passing score. But you will have to follow a very strict program for budgeting and monitoring your credit score. We have an E-Learning website, www.PennyWatchers.org which you can have complete access to, and there's no additional fees or charges for the use of this e-Learning website. This is really a do-it-yourself program. But we always will review your credit reports to determine if there's any violations of the law and there's never an additional charge. It's important, therefore, for you to understand the difference 'debt management' (aka credit counseling) versus 'Debt Consolidation'. You can see our matrix chart, which compares the pluses and minuses in order to fully understand and appreciate these differences. In debt management, aka credit counseling, you might or might not get a good credit score. Whereas, in Debt Consolidation, you will only have a poor credit score. Q5. How long is the typical Debt Consolidation Plan with CT Debt Consolidation? The length of time for a Debt Consolidation Plan depends on your financial resources. We have some clients who can pay in one lump-sum their entire Debt Consolidation Plan. And typically, we tell these clients it can take 6–8 and months and even one year to satisfactorily settle all of your debts. But most clients can't pay one lump-sum to settle all of their debts. They just don't have the money. Most clients have to use a payment plan to settle their debts. These payment plans range from 2–5 years. The length of the Debt Consolidation Plan depends on the amount of your debt and your ability to make monthly payments. Q6. How is the CT Debt Consolidation different than any other Debt Consolidation Company? CT Debt Consolidation believes in explaining your options to you in a clear and down to earth style. We help you weigh the pluses and minuses of any and all options for settling your debt. Therefore, we offer the most comprehensive and fair analysis, and help you select the best option for yourself. We explain in detail and compare and contrast the 4 major options, namely, Debt Management, Debt Consolidation, Chapter 7 and Chapter 13. Each one of these is a choice and when the choices are analyzed from the perspective of monthly payments, length of time to complete the option, total cost of each option, affect on your credit score, and numerous other factors, then you the consumer can make the most informed decision. No one compares all of these options with only your best interests to guide them. As an attorney, I am obligated to explain the pros and cons of all the options, analyze them in terms of monthly payments and total amounts paid, and make a recommendation to you. Debt Management and Debt Consolidation Companies will not begin to discuss with you in detail your bankruptcy options and compare it to what they are offering you. Many, many consumers use a Debt Consolidation Company because they feel that if they file for bankruptcy they are a 'failure' and they are embarrassed. Therefore, ironically, they will select the most expensive and impractical alternative and they shy away from bankruptcy because they just don't want to look at it. On the other hand, there are consumers who just want to file for bankruptcy and will not consider any other alternative even though they don't qualify for bankruptcy. We professionally and objectively weight and explain all the options and present the reasons why someone should use Debt Consolidation or Debt Management and/or, we explain all the issues and problems of filing for a bankruptcy. We view the informal or out of court options of Debt Consolidation and Debt Management as just as valid as the formal options of Chapter 7 and Chapter 13. To our knowledge, there is no one that dispassionately weighs and compares all options and presents that analysis in a comparison summary report. Q7. What is the difference between Debt Consolidation and Debt Management? In a Debt Consolidation Plan you pay 40% to 60% of your outstanding debt to settle your debts with the average being 50%. In Debt Management, you pay 100% of your debt and you pay a reduced interest charge on your debts. There are pluses and minuses for Debt Management versus Debt Consolidation. You should see our matrix chart. With Debt Management, you pay considerably more money to get out of debt; whereas, with Debt Consolidation you pay considerably less money and it's faster. However, Debt Consolidation is more of a 'rocky road' to travel than Debt Management. Again, you have to see our chart. Sometimes, people obtain a 'consolidation loan' to pay-off their debts but really they just substitute a number of small debts into one large monthly payment. This is an example of 'Robbing Peter to Pay Paul', which really doesn't improve your finances. Q8. What is a secured debt versus an unsecured debt? Since CT Debt Consolidation only can deal with unsecured debts, clients ask me: What is a secured debt and what is an unsecured debt? Secured debt is a car loan or a mortgage on a home. If you don't pay on the debt, the creditor can collect its money by selling your car or home because the 'car' or 'home' is security for the debt; hence, it is called a secured debt. On a secured loan, the creditor can, of course, try to collect any money due and owing by attaching your wages, banking accounts, etc. Unsecured debts are credit cards, personal loans, medical bills, rent payments or any debt, which doesn't have property as 'security for the debt'. The only remedy available for the creditor when you haven't paid on an unsecured debt is to collect the money due and owing from your wages, and/or your bank accounts. Only Chapters 7 and 13 of the Bankruptcy Code have the legal power to deal with secured debt. Q9. How can I be assured that your Debt Consolidation Plan will work? The best assurance you have that our Debt Consolidation Plan will work for you is that I have been doing non-bankruptcy options for a considerable period of time (27 years) and I'm honored to tell you that people know that I'm here to help them with the best financial advice for the consumer. I have been recognized as an Expert in Consumer Bankruptcy because I am Board Certified by the American Board of Certification, and I have worked successfully in the past with clients using non-bankruptcy options in order to solve financial problems. So I would have to say that my reputation in the community is your assurance that your Debt Consolidation Plan will work for you. For example, since I am not licensed to practice law in any other state except Connecticut, I only offer my 'Debt Consolidation' plans to residents of Connecticut. I have been in the community practicing law for 32 years with no complaints. Q10. Do you offer any guarantees with your Debt Consolidation Plan? No one can really offer you a 100% guarantee that our Debt Consolidation Plan will work for you. The most our law firm or any law firm can say is 'based upon past experience, our Debt Consolidation Plan should work for you'. Q11. What should I expect from a Debt Consolidation Plan? You can expect to become debt free from credit cards for considerably less money and time than you would in a Debt Management Program where you pay 100% + % on your total debt. The savings are considerable with Debt Consolidation versus Debt Management. We will give you a comparative financial analysis between Debt Consolidation and Debt Management, which are your 'informal options'. And we will, also, include a comparative financial analysis between Chapter 7, Chapter 13 Bankruptcy and Debt Consolidation and Debt Management so you can see the cost and potential savings. Q12. Will all my debts be canceled once I finish my Debt Consolidation Plan? At the conclusion of your Debt Consolidation Plan, all your debts you listed with us will be canceled. Sometimes it might take longer than we expected due to changing policies with creditors and our attempts to obtain for you the best possible results. But there are no additional fees or costs if it does take longer to secure good Consolidations. Primarily, it can take longer than projected because people have to reduce their monthly payment and, of course, this changes the time period when you pay less than planned. However, in Debt Consolidation, you can change your monthly payment; whereas, in a Chapter 13 Debt Consolidation Plan, it's difficult to say the least, to change your monthly payment plan. Q13. Are all my debts included in a Debt Consolidation Plan? You don't have to include all of your debts in a Debt Consolidation Plan. First, our Debt Consolidation Plan only deals with credit debt and general unsecured debt like personal loans, medical bills, etc. Our Debt Consolidation Plans don't deal with mortgage arrearage, car payments and other secured debts. Second, in Debt Consolidation you have greater flexibility in dealing with your debt because you can keep any credit card you decide should not be included in your Plan. In Chapter 13, you have no choice of excluding any credit card from your Chapter 13 Plan because the law is very clear that you have to include all your debts. Q14. Do I have to be approved for a Debt Consolidation Plan? After we objectively and thoroughly explain your options in handling debt, we have to jointly agree with you that a Debt Consolidation Plan is your best option. First, we have to 'run the numbers' and analyze what your monthly payment will be in Debt Management versus Debt Consolidation versus Chapter 7 versus Chapter 13. We have not found one company, which is capable of this financial analysis. We have a special Excel spreadsheet where we can enter your income and expenses and then enter your total amount of debt, and can obtain an extremely and accurate analysis of all 4 major options and then compare them. As part of this analysis, we will urge you to use our website: www.pennywatchers.org or our manual system. This involves analyzing your income and expenses. Then we review the 12 Basic Reasons Why People Either Can't or Won't File a Bankruptcy Petition. We, also, have a matrix chart, which presents all the Pluses and Minuses of each Option. We will make a recommendation as to the best option for you and explain the reasoning. Our mission is to help you make a knowing and informed decision and we guide you in making that decision but ultimately once you are fully informed and the options objectively analyzed, you make the decision whether to use Debt Management, Debt Consolidation, Chapter 7 Bankruptcy or Chapter 13 Bankruptcy. Many times clients want to use a Debt Consolidation Plan because no one wants to go to the hospital, people do not want to file bankruptcy. But if we determine that you really can't complete a Debt Consolidation plan and that it's not in your best interest, we won't recommend it and will respectfully decline to enrol you as a client. And please note there are at least 5 basic reasons why people can't file bankruptcy even when they want to file bankruptcy. We consult with clients and help them weigh options and make certain that false information about these options doesn't cloud their judgment. We do a detailed Income and Expense Statement for you. We accurately develop what is your exact income and what are your ordinary and necessary expenses. Once we have accurately developed your income and expenses, in many cases we will do the long form 'Means Test' analysis under Chapter 7 Bankruptcy to see if, even though your income is over the medium income, could you rebut the presumption of abuse in filing a Chapter 7 petition. We have had clients come to our office from other attorneys who told them that they couldn't file for bankruptcy and found that they could rebut the long form of the Chapter 7 Means Test and consequently, they filed a Chapter 7 bankruptcy petition through our office. Q15. Do my debts have to be delinquent in order to do Debt Consolidation? Most of our clients with whom we start to analyze their finances are already delinquent with their accounts. We will not advise you not to pay on your debts when you have the means to pay those debts. Here's where the analysis of your income and expenses becomes critical in deciding whether or not you really can continue to pay on your accounts. If your income is exceptionally strong and you can pay on all your debt but simply need the interest rate reduced, then we recommend that you use Debt Management aka Credit Counseling, and with usually refer you to Consumer Credit Counseling Services (CCCS) or Money Management International because they are licensed and bonded with the State Banking Department. In this option, you pay 100% of your debt and you do not become delinquent with your payments. They will reduce your interest charges and usually they have a 5 year plan for you to pay-off all your debts. Without the reduced interest rates which they can obtain through debt management, you usually will have to take 10 to 15 years to pay off your debts with the same monthly payments which will be in your debt management/credit counseling plan. Note that they don't do any 'credit counseling' but they are referred to as 'credit counselors', which is really a misnomer. They are debt managers and not credit counselors because they don't advise you under the Federal Credit Organization Act (CROA). We do inform you that Debt Management Companies such as CCCS/Money Management International were established by the credit card industry and, therefore, they tend to have a bias toward only offering 'debt management' and really don't analyze and evaluate the legal options of bankruptcy. However, they will argue and rightfully so, that they aren't attorneys and can't practice law which is correct. Many times if someone isn't a suitable candidate for debt management, they so inform the potential client but really they can't function in the full capacity of a debt and credit counselor because either they don't have the background and/or they aren't licensed to practice law. We advise clients that since the credit card industry has tightened its grip on Debt Management Companies by rigidly auditing their work, if they are a high income earner, they might not get any concessions on their interest rates. CT Debt Consolidation has extensive experience with debt management and will fully and impartially weigh that option with you. And, indeed, if CCCS's aka Money International program is best for you, we will refer you to them. But, to answer the question, "Do I have to be delinquent on my accounts in order to use Debt Consolidation'? the answer is 'Yes' because unless you are delinquent on your accounts, the creditors will not agree to any Consolidation. But as I have said above, we will never advise you not to pay on any debt that you are capable of repaying. If you aren't delinquent there won't be motivation on the part of the credit card company or the creditor to negotiate a Consolidation. And now this is one of the negatives of Debt Consolidation, namely, if you have a good credit score and if you have to decide that you can't continue paying on your credit card debt because your overtime at work has expired and/or you are tired and run-down from your second or third job, your spouse has lost his/her job and/or you can't pay the rent or the mortgage, your credit score will suffer. Q16. Can I try using Debt Consolidation and if it doesn't work, can I convert my file to a bankruptcy filing? Yes, we have many cases where a person can't under the 'Means Test' or under the 'Totality of the Circumstances Test' or under the 'Asset Test', file a Chapter 7 petition. But then events in people's lives change. People become sick, unemployed, divorced, separated etc. And they then can qualify for a Chapter 7. I tell clients that 'in their weakness is their strength and in their strength their weakness'. In the Bankruptcy Court, you can file a Chapter 13, which is a Debt Reorganization, and then convert to a Chapter 7, which is a Debt Liquidation. The same is true with an informal or out-of-court Debt Consolidation Plan. You can convert it to a formal bankruptcy. And we have clients who are in a grey area of what option is best for them. For some clients, the numbers are so definite, there's only one answer for them. But there are many clients who are in a 'gray area' and there is no obvious and absolute answer. And if the client makes a completely informed decision to use Debt Consolidation, and then they really get to 'try it on' and after awhile it becomes too burdensome, they are free to convert to a formal debt cancellation program. And I have had many clients tell me, 'You told me that you didn't think I would be a happy camper in Debt Consolidation and you were right. But it was good that I got to try it.' This applies to people who to me are in the 'grey area' regarding their options. Q17. Can I simply do Debt Consolidation by myself without the help of anyone? Yes, you can be your own attorney and do debt Consolidation and you don't have to use an attorney-at-law. You can represent yourself and you'll be 'pro se' or 'for yourself'. But when you receive a Consolidation from a company, I have seen where 5 years later, another bill collector representing the same creditor starts trying to collect on the same debt. And they report to the credit bureau that you still owe on this debt! Now what are you going to do? And let's suppose it's one of those debt scavengers who purchased debt, which has been discharged in bankruptcy, and/or debts that have been settled? (these companies are ferocious!) (You could ask me,' How can anyone purchase debt that was discharged in bankruptcy? And expect to collect on it? And can anyone attempt to collect on a settled debt? Yes. Companies which buy debt actually buy debt discharged in bankruptcy! And what about the tax ramifications of settling debt? Many tax preparers believe that debt, which is settled or compromised, represents 'imputed income' to you and you have to pay taxes on the discharged or settled debt. They know of no exceptions. One client came to me who compromised his own debt and then paid income taxes on it. Due to our free consultation, he amended his tax return and received a $5,000.00 tax refund. Yes, you can represent yourself but as Abe Lincoln said, 'A person who represents himself, has a fool for a client'. Q18. Will interest charges, and late fees accumulate on my credit cards while I'm doing Debt Consolidation? Once you are enrolled in a Debt Consolidation Plan (DCP), creditors continue to charge interest rates, charge you late fees, yearly fees, and anything else they can concoct. Q19. Does CT Debt Consolidation contact all of my creditors? By law, once an attorney informs a creditor that you are represented by that attorney, the creditors can't call you or write to you. Once you are enrolled in our Debt Consolidation Program, as I indicated above, we will send a letter to all your creditors and advise them that I represent you and to direct all their calls to my office. There's a high compliance rate with the Federal Debt Collection Practices Act because they have been sued so many times that they have finally gotten the message. Q20. When I am doing a Debt Consolidation Plan, will creditors continue to harass me? Creditors and bill collectors seem to be constitutionally disposed to violating the law. When you enrol in our Debt Consolidation program, we send letters to all your creditors directing that all your bills be forwarded to our office. It will take a little time, but we are able to stop the harassing phone calls. Further, when you are enrolled in our Debt Consolidation Plan, we're going to give you my booklet entitled, 'A Consumer Combat Manual for Handling Harassing Phone Calls'. I tell my clients to simply read it and use it. And do you want to know a secret? You simply write them a letter return-receipt requested telling them not to call you and if they call you they have violated the law. My booklet has all this useful information and more. Further, under the law, once an attorney represents you, no one can call you about your financial matters. All your calls come to my office after you tell them simply,' Call my lawyer'. I have far more strategies than I can discuss on my website but in a private consultation, I'll make you aware on how to enforce the law against harassing phone calls by bringing a law suit under the Federal Debt Collection Practices Act or under Connecticut's law which prohibits harassing phone calls, and you'll possibly be compensated for the harassing phone calls. It is our experience that by using my booklet and the procedures where we direct all your bills to be delivered to our office, your harassing phone calls go away. But that doesn't prevent the creditors and/or the bills collectors who have purchased your debt from bringing law suits. You simply bring those law suits to our office and we'll review them with you. Also, we have a special video on the Telephone Communication Protection Act (TCPA) which hold that if a creditor calls you on a cell phone and you haven't given them permission, this call is a per se violation of the law and is subject to a penalty of $500 to $1,500 PER CALL! Q21. I understand and have heard that Debt Consolidation Companies have a bad reputation. How do I guard against scam artists and fraud? On television there are constant ads for debt Consolidation companies. First, all of those ads are from companies in California, Texas and Florida or from out-of-state companies. They have websites and toll free numbers and they promise you the sun, the moon and the stars. And as a rule, if something sounds too good to be true, it usually is. Do they have a local office that you can go to and talk to a person? No because they don't have any local offices. Are they licensed and bonded by the Connecticut Banking Department or the Connecticut Judicial System? You can checked out if they are licensed by the Connecticut Banking Department by going to: http://www.ct.gov/dob. Then click-on Verify a License. Next click on Debt Adjuster. You'll find all the licensed and bonded Debt Adjusters on this website. They will tell you that they aren't debt adjusters and; therefore, they don't have to be licensed and bonded with the banking department. Call the Banking Department's toll free number (800) 831-7225 and ask to speak to the Consumer Credit Department. Ask the staff person if the company should be licensed and bonded by the banking department. The Debt Consolidation Companies will tell you that they aren't 'Debt Adjusters' but rather are 'Debt Settlers' which are 'Debt Negotiators' and they might claim that they don't have to be licensed and bonded by the Banking Department. BEWARE! Conduct an Internet Search; enter the company's name followed by the word 'Fraud' or 'Scam' and see what you find. Go to the Internet to www.ripoffreport.com and do a search on the company's name. Go to the Internet and search 'Debt Consolidation Fraud' in Google and Yahoo and see what you find. Go the Federal Trade Commission website and search for Debt Consolidation Companies: www.ftc.gov. Ask the Debt Consolidation Company for the list of names of people in Connecticut they are servicing and ask for their telephone numbers for references. They have slick websites but usually do not have names of anyone responsible for the website. See if you can find a name and picture of the person responsible for offering the debt Consolidation services. I have heard many, many horror stores from clients who finally discovered us and came to my office after they had been ripped-off by out-of-state debt Consolidation Companies. 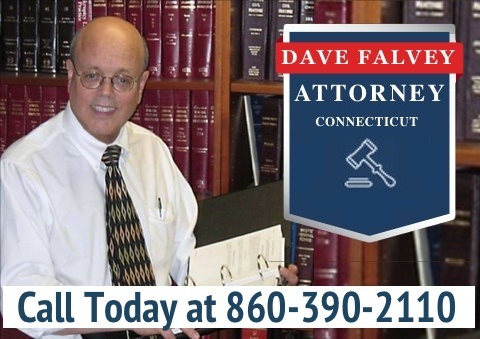 Now you should ask: What about yourself, Dave Falvey and CT Debt Consolidation? What are your references? Are you licensed and bonded by the Banking Department? My answer: Attorneys don't have to be licensed and bonded by the Banking Department because we are licensed by the Judicial Department and the way to check on myself as being in good standing with the Connecticut Judicial Department here. Q22. Why is our CT Debt Consolidation service different with any other Debt Consolidation Company? What about my credit score? I know of no attorney who regularly weighs all basic options of handling your debt other than us. I know of no debt Consolidation or debt management company which even has the understanding to analyze and explain the different options. And notwithstanding their lack of understanding, they actually can't explain and contrast the informal options with the formal options because they aren't attorneys. The client is explained the pros and cons of all the basic debt option strategies of debt management, aka credit counseling; debt Consolidation or debt negotiation; Chapter 7 Bankruptcy and Chapter 13 Bankruptcy. The client has to understand the 12 Basic Reasons why someone can't or won't file a bankruptcy petition. The client has to have their individual circumstances evaluated for doing using one of the basic 4 options. They have to have their income and expenses evaluated. Some times they have to have their income evaluated in the 'Means Test' when they are over the medium income for bankruptcy. And then the client has to receive a print-out to compare the financial aspects of debt management, debt Consolidation, Chapter 7 and Chapter 13. We at CT Debt Consolidation have developed a unique and proprietary program for financially comparing and contrasting all 4 basic options. Frankly, there is no one to my knowledge who can give you this type of analysis. I'm able to give you this type of analysis because I have represented clients in debt management, Debt Consolidation, Chapter 7 and Chapter 13. And I took all my understanding and with a programmer, developed an amazing and proprietary system for instantly comparing and contrasting all the financial aspects of the 4 Major Options. Once the client is fully informed about the options and their finances analyzed, then in consultation with the client, an Action Plan is agreed upon. I see our professional responsibilities as helping a client understand their options. Dispelling myths and propaganda of the credit card industry and other organizations. Assisting the client in making the most informed choice or decision in dealing with their debts and credit scores. Finally, as I have indicated in other questions, we have extensive educational materials to assist our clients in obtaining a good credit score. I have defined as 'fresh financial start' as not just canceling debt. I define a 'fresh financial start' as a good credit score. I have worked with many individual clients to help them improve their credit scores. And from those experiments, and my reading of the Federal Fair Credit Reporting Act, and the Fair and Accurate Transaction Act and other readings and investigations, I have an extensive 2 hour seminar on DVD on how to improve your credit score within 12–24 months. Further, I have an e-Learning website to assist my clients and you can find it at www.PennyWatchers.org. 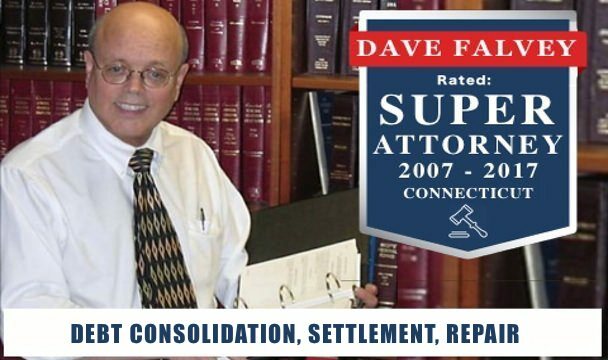 I'm Dave Falvey, 1 Crouch St, Groton, CT 06340; Tel: 860-449-1308 and I have been attorney with the State of Connecticut for 32 years and my State Juris Number is: 101894 and my Federal Juris number is : CT 08516 and I am in good standing with the Bar Grievance Committee and you can contact them at: www.jud.ct.gov/SGC/ -Statewide Grievance Committee, 287 Main St., Second Floor, Suite Two, East Hartford, CT 06118-1885; (860) 568-5157; Fax (860) 568-4953. Q23. What is Chapter 7 bankruptcy and what is Chapter 13 bankruptcy? A Chapter 7 Bankruptcy is called a 'liquidation' and, therefore, many people think that they are going to be 'liquidated'. A Chapter 7 takes 90 days from the date of filing to the date of discharge. After 90 days, you receive a Notice of Discharge. In a Chapter 7, you make no payments to creditors. All your debts are liquidated or discharged; however, there are debts which can't be discharged in bankruptcy some of which are: student loans, child support, alimony, sales taxes, employee withholding taxes, fines, orders for restitutions, willful and malicious injury to another person, crimes, injury caused to another due to alcohol or drugs while operating an automobile, airplane or vessel are some of the major non-dischargeable debts in Chapter 7. Debts incurred through fraud and/or embezzlement are non-dischargeable in bankruptcy. Some of the debts which are dischargeable in Chapter 7 are: credit card debts, car loans, repossessions, personal loans, medical bills, mortgages, deficiency judgments, personal income taxes if they meet 5 criteria, utilities, and back rent, to name a few. Chapter 7 is the fastest and least expensive option of getting rid of your debt. And with good exemption planning, you usually can keep your home, car and other assets. Pensions are not considered an asset of the bankruptcy estate and; therefore, they are protected from creditors. A Chapter 13 is called a 'Debt Reorganization' and you will see many similarities between Debt Management and Debt Consolidation with a Chapter 13. But a Chapter 13 has more powers than any informal Debt Management strategy. Chapter 13 can deal with mortgages and car loans. Chapter 13 takes 3 to 5 years to complete and every month you make payments to a Chapter 13 Trustee. You don't receive a Notice of Discharge until you complete your Chapter 13 which is usually 3 to 5 years. Usually, you use a Chapter 13 when you are seriously behind on your mortgage payments or your house is in foreclosure. But Chapter 13 can be used just to repay on credit card debt. I advise clients that usually, Chapter 7 is the best option for obtaining a 'fresh financial start' because it's quicker and less expensive as compared to a Chapter 13, Debt Management or Debt Consolidation. But again this is just a general rule and one rule doesn't fit all clients. Q24. What are the pluses and minuses of Debt Consolidation vs. Bankruptcy? You will find on our website a matrix chart which gives the pluses and minuses for all informal and formal options in handling your debt. Informal options are ones where you don't go to Court. Informal options are Debt Management and Debt Consolidation. Formal options are when you go to Court and they include Chapter 7 and Chapter 13 Bankruptcy. You should go to our matrix chart section, which compares options and read it. Also, it's very important to read our chart on the 12 Reasons You Can't or Won't File for Bankruptcy. Essentially, I tell clients that usually Chapter 7 is the best option in dealing with debt. And I don't say that because I'm a bankruptcy attorney. I have had extensive experience in operating a non-profit debt management company or a 501 (c) (3) corporation for many years. I have intimately dealt with clients' credit reports and credit scores both with Chapter 7, Chapter 13, Debt Management and Debt Consolidation. And I want to report to you that the reason the credit card industry spent millions of dollars to enact the latest bankruptcy law (called: BAPCPA Bankruptcy Abuse Prevention and Consumer Protection Act of 2005) is because they wanted to deny you a 'quick fresh start' in Chapter 7. To some degree, the credit card industry was successful in preventing people from filing a Chapter 7 and forcing them into a formal 'debt Consolidation plan' or 'Debt Management Plan' called a Chapter 13 Bankruptcy petition. Now granted, the creditors haven't had all the success that they wanted in preventing people from filing a Chapter 7 bankruptcy (in Chapter 7, you don't make any repayments on debts) , but they have prevented some people from filing a Chapter 7 petitions. Indeed, some critics of BAPCPA take the position that the credit card companies ultimately failed in their attempt to turn the Bankruptcy Court into their private 'collection agency'. However, they have driven-up the cost of filing bankruptcy with all the 'new requirements'. Essentially, the credit card industry through their attorneys and accountant, went to the IRS Code and Standard of Collections, and took many of their rules and grafted them into the Bankruptcy Code. So today when you file a Chapter 7 petition, you are really subject to the IRS standards of collection which in effect is an IRS audit. But there is a percentage of people who can't file Chapter 7 under BAPCPA and have to seek other options or avenues, namely, Debt Management, Debt Consolidation or Chapter 13. The credit card industry has 'sanctioned under their auspices' Debt Management but they haven't 'sanctioned' Debt Consolidation. Q25. Why can't the Better Business Bureau stop scam artists from using their name? And what you should know. First, let me say the goals and purposes of the Better Business Bureau are absolutely worthwhile. They want to protect the public by having businesses subscribed to a code of ethics and want to report businesses that do not follow a code of ethics. There's no argument to me that their efforts are very worthwhile. But I have discovered how some slick scam artists use the Better Business Bureau to further their scams. How? Let's say that the scam artist starts with XYZ Debt Consolidation Company and advertises that they subscribe to the ethics of the Better Business Bureau. After awhile, they get many bad marks or reports about XYX Debt Consolidation Company. The scam artist realizes they have many legitimate bad marks against the company so what do they do? They open another company called the ABC Debt Consolidation Company and register the new company with the Better Business Bureau and since they are a new company, they won't have any bad marks against them. Therefore, one important factor to look for is how long the business been in operation! Also, in all fairness to the Better Business Bureau, they have refused to even list Debt Consolidation Business on their website due to the tremendous problems involving fraud with these groups. I have had so many clients tell me, 'And I checked them out on the Better Business Bureau and they didn't have any bad marks against them.” The scam artists are slick! And as I told you above, if you ask the Debt Consolidation Company if they are licensed with the Connecticut Banking Department, or any department, or branch of government, they would at one time piously tell you that they don't have to be licensed nor bonded. They will tell you that they aren't DEBT ADJUSTERS! And, yes, they weren't under Connecticut's law 'Debt Adjusters' but rather they are now under Connecticut law classified as 'Debt Negotiators'. Their legal loophole has been closed. And, I use to say, if they aren't adjusting debts and they are telling you they are getting creditors to settle their claims for $.50 on the dollar, what are they doing? I called them Debt Adjustors. But they would tell you at one time that since they don't hold your funds in a trust account, they weren't Debt Adjusters. This was used as a technicality so that they circumvent the law. However, States' Attorney Generals across the nation supported "The Uniform Debt Management Services Act as drafted by the National Conference of Commissioners on Uniform State Laws (WWW.NCCUSL.ORG), which was designed to close this loophole. And this loophole was closed. Now all Debt Negotiators come under this law. And that's why there are almost no Debt Negotiators licensed in Connecticut who aren't mortgage companies. And the one Debt Negotiator who is licensed in Connecticut has come under serious scrutiny by the Banking Commission. This company has no physical office here in Connecticut. Can Dave Falvey Help You Get Out of Debt? I'm Dave Falvey and I provide non-bankruptcy options like debt consolidation and settlement. I've helped people with bill problems eliminate their debt, repair their credit rating and show them how to make informed financial decisions. I’m committed to offering the best debt management strategy available to help you get your finances back. Many have been where you are today and are now completely satisfied that they put their trust in my debt consolidation services. And I'm happy to have helped them find a better way of getting out of debt. I'm a proud member of the National Association of Consumer Bankruptcy Attorneys, the National Association of Bankruptcy Trustees and the United States District Court for the District of Connecticut. In addition, I’m an American Board of Certification, Certified Attorney and a member of the National Organization of Chapter 13 Bankruptcy Trustees. Can Businesses Benefit From Debt Consolidation? Solving debt problems for individuals and businesses since 1983. We are your first step to becoming debt free - Contact us: 860-449-1308 - we will help you understand your financial situation, how to fix it, and how to move on to a better life. "I can't thank them enough, and I encourage anyone considering them to move forward and seek their assistance. If the road you want to take is not the correct option, they will work with you to find that proper road! Great experience, and thanks so much!" Our office is Located at 1 Crouch St., Groton, Connecticut, 06340. We are an officially recognized Federal Debt Relief agency.